Among primers on meditation, this book is exceptional in how it guides readers who treasure inner growth and are looking for reliable direction on how to achieve it in an authentic and sustainable way. The author, a student of the Indian yogi Paramahansa Yogananda, distills the teachings of many other spiritual traditions and religions, including Christianity, into an interfaith perspective that will appeal to all seekers of the divine. Specific elements include the foundations of spiritual practice; the benefits of energy-building exercises, affirmations, and healthy lifestyle regimens; instructions in mantra practice and inner-sound meditation; techniques for effective prayer; and guidelines to measure inner practice. The book's accessible narrative and universal themes make it enjoyable to read and life enhancing to apply. Rev. Pritz also developed and taught a workshop on spirituality in the workplace at the University St. Thomas Management Center. He has written a training component on this topic for the American Management Association, developed an integrative medicine training on Yoga, Meditation, and Spirituality for the University of St. Thomas Center for Medical Affairs, and has written numerous articles concerning related themes for Minnesota Physician, Employee Benefits News, Twin Cities Wellness, and The Edge. His work has been written about in journals including Business Ethics Magazine, Employee Benefits News, and Alternative &amp; Complimentary Therapies. For more information, visit his website at Awake-In-Life.com. 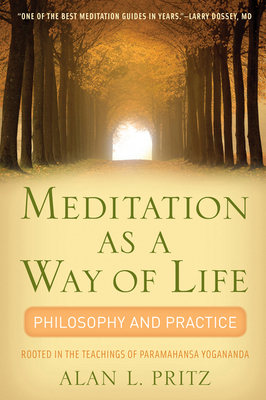 "Meditation as a Way of Life is a wise, user-friendly guidebook for your spiritual journey. Folks of all faiths will find interesting, practical, "how-to" tips for stretching, breathing, meditation, and more. I found the book a very interesting, unique read. Thank you Alan!" --Lilias Folan, author of Lilias! Yoga Gets Better With Age and host of PBS Yoga series Lilias! "One of the most valuable things you can do to improve your life is to open your mind, heart and soul to the wisdom of intuition and the Divine. Alan Pritz has written this lovely meditation guide to aid you on that journey. If you want to further develop your intuitive abilities, deepen your connection with the mystical and become calmer and clearer, this is the guide for you." "Meditation as a Way of Life is an excellent guide for anyone interested in yoga, spirituality and religious studies. It can serve as an introduction or for people looking to deepen their understanding of yoga and meditation. This book is not about religion. Yoga is not a religion. But Pritz has a large scope, allowing readers of any faith to identify with Yogananda's teachings. Because let's be honest, it's all the same message at the core. One of my favourite pages demonstrates mantras we can use to help us concentrate. Pritz includes Christian, Jewish, Islamic, Tibetan Buddhist, Hindu and "secular" chants. But again, it's all the same thing. The other day, I found myself sitting in a circle chanting Allah! Allah! It took me by surprise but was invigorating. While certain words are less relatable to us, chanting Allah! is just the same as chanting Om Mani Padme Hum. Or Shanti Shanti Shanti. For some, it's reciting a familiar prayer. The book starts off as a funny, interesting autobiographical account of author Rev. Alan L. Pritz's journey to finding his guru, or Enlightened Guide, Paramahansa Yogananda. Cartoon illustrations show us practical stretching exercises for the entire body, as well as breathing exercises like alternate nostril and Full Yogic breath.